Home > News > All > HoNloween! Join us if you dare, for a HoNloween fare. Play, win and be scary. Please remember Ghosts, Skeletons, Spirits and Pumpkins will come walking through the middle of river. So be prepared to run away from them. Halloween Candy can only be used in Halloween Event. It is something like Plinko Tickets. You can collect candies to get items. 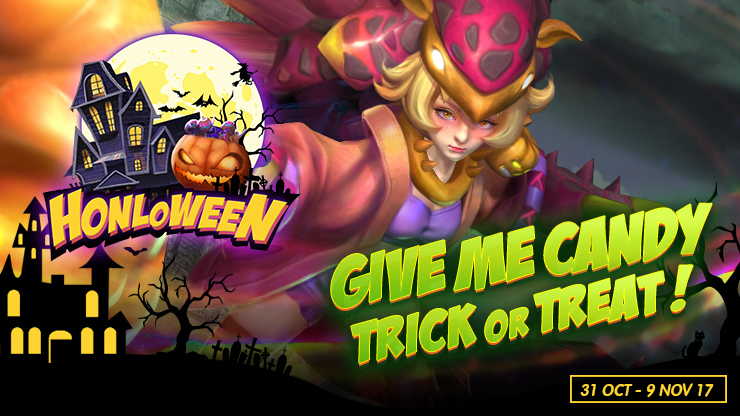 You can get candies from taking part in halloween events, or purchase Candy through Halloween lucky draw. Collect candy and exchange for valuable prizes in the "HONloween Candy Shop!" Consume candies to get the item you want. You can open one slot for free after you login the game everyday; so if you logined 10 days continuously, you will be guaranteed to get all the rewards! Reward: 15 Candies at most , Each win in CoN can get 1 candies. Spin the lucky wheel to get candy or an exclusive avatar! Players can get halloween grabbag from the lucky wheel after got arma donna, and get 30 candies if they already owns all items in the grabbag. Top up gold coins to reach different points on our Halloween Spending Milestone. When you have topped up enough gold coins, you can click the button below and claim the reward! When you reach the Grabbag tombstone, you will get an account icon! Use it to open the premium halloween grabbag in Store!